Engineers at the Massachusetts Institute of Technology (MIT) have developed a tiny MRI sensor that can be used with magnetic resonance imaging (MRI) technology to accurately measure electrical and optical signals in the brain. MRI scans monitor changes in blood flow and are used to indirectly measure brain activity. While MRI scans have their uses, in order to study brain activity in more depth, it is necessary to study electrical activity in the brain. Electroencephalography (EEG) is non-invasive and can be used to measure electrical activity in the brain, although this method also has limitations. With EEG it is not possible to determine the exact origin of electrical activity. The alternative is to insert an electrode into the brain; however, the technique is invasive and while it allows much more accurate measurements to be taken, it can result in tissue damage. MIT engineers have been working on a new type of sensor that allows electrical activity to be measured accurately in a minimally invasive way. The sensor they developed is just a few millimeters in size and can be inserted in the brain. In addition to detecting electrical activity, it can also detect optical activity from luminescent proteins, which can be produced by a variety of molecules. Once the sensor is implanted, it can be left in place. It requires no wires, nor any power supply. With MRI scans, radio waves are detected when they are emitted by the nuclei of hydrogen atoms in water. The MRI scanner included a large antenna which is capable of detecting those radio waves. The sensor also incorporates an antenna, albeit a much smaller version, which receives the radio waves in the same way as a standard MRI antenna. The sensor is tuned to pick up the radio waves of the hydrogen nuclei. When an electromagnetic signal is detected in the tissue, the tuning is altered so it doesn’t match that frequency and a weaker image arises when the sensor is scanned by the MRI machine. 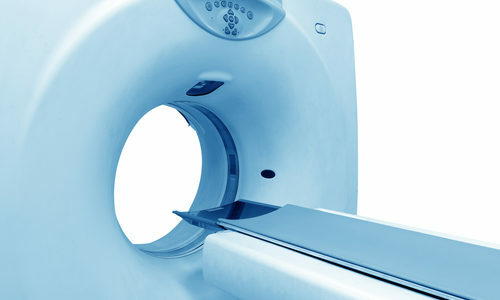 The radio signals that the MRI scanner emits are enough to provide power to the small sensor, so no battery is required. The researchers demonstrated their sensor is capable of detecting electrical signals similar to the action potentials of neurons and local field potentials of a group of neurons. “We showed that these devices are sensitive to biological-scale potentials, on the order of millivolts, which are comparable to what biological tissue generates, especially in the brain,” said Alan Jasanoff, MIT professor of biological engineering, brain and cognitive sciences, and nuclear science and engineering and senior author of the paper. The sensor can also detect light signals, such as those emitted by the protein Luciferase in cells engineered to express the protein. The sensor allows much more precise pinpointing of those cells than is currently possible with existing techniques. The researchers were able to demonstrate that the sensor was able to pick up those signals in living brain tissue in studies on rats. The researchers believe that it will be possible to reduce the size of the sensor further still. Their research has shown that it should be possible to reduce the size to 250 microns and still be able to detect electrical signals of around 100 millivolts – that of neuron action potentials.